The leading vendors of personal computers would much rather put the trials and tribulations of last year behind them, but the industry analysts won't let them. 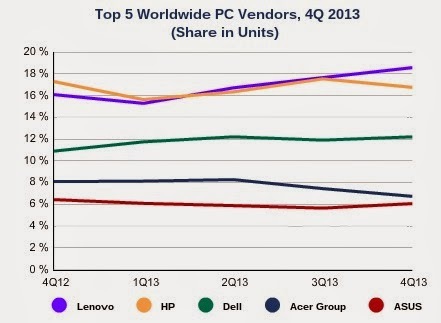 Worldwide PC shipments totaled 82.2 million units in the fourth quarter of 2013 (4Q13), representing a year-on-year contraction of -5.6 percent, according to the latest market study by International Data Corporation (IDC). For the full year 2013, unit shipments declined -10.0 percent from 2012 -- that's a record drop reflecting the changes in mobility and personal computing affecting the mature PC market. While commercial purchases helped to prevent a larger decline, the consumer side remained weak. "The PC market again came in very close to expectations, but unfortunately failed to significantly change the trajectory of growth," said Loren Loverde, vice president at IDC. Total shipments have now declined for seven consecutive quarters, and even the 2013 holiday shopping season was unable to inspire a turn in consumer spending. Although U.S. growth slipped a little in the fourth quarter, other regions all improved. In the United States, market leader HP had a difficult quarter, contracting -12.3 percent year on year as the market slowed following an HP surge in the third quarter. However, some Asian manufacturers -- such as Lenovo and Samsung -- achieved strong double-digit growth, driven partly by a modest commercial uptick and due to acceptance of their Chromebooks. Dell and Toshiba also managed mid single-digit growth, essentially coming from large corporate refreshes in the enterprise segment. Nevertheless, despite a dip in total shipments, the U.S. market outperformed most other regions and the worldwide market as a whole for the fifth consecutive quarter. With shipments totaling 17.1 million PCs in 4Q13, the U.S. market contracted by -1.6 percent from the same quarter a year ago. Consumers continued to take a wait-and-see approach, leading to delayed purchases. The migration from Windows XP to Windows 7 and 8 continued to drive some momentum in the enterprise sector and once again businesses fared better than consumers. 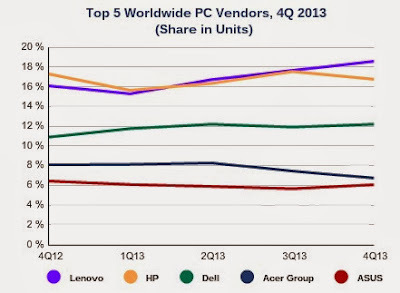 The PC market in EMEA remained constrained in the final quarter of 2013. As expected, demand in the commercial segment was supported by year-end budget spending, with end of support for Windows XP deals contributing to even stronger shipments in the last three months of the year. As anticipated, the consumer market remained much more depressed, with shipments remaining soft amid ongoing weakness in demand, as media tablets continued to attract more buyers.